Love Italian food? A discounted Maggiano’s gift card is the perfect way to enjoy Italian-American cuisine in a warm and inviting atmosphere you’re sure to love- while saving money! Open daily for lunch and dinner, all their food is made from scratch daily and prepared in classic & contemporary dishes, such as handmade pasta, salads, fish, steak, and a variety of specialty dishes, drinks, and desserts. Purchase a Maggiano’s gift card today and let someone else do the cooking tonight! Bring in the entire family for family-style dining or order carryout and enjoy menu items, such as Marguerite flatbread, butternut squash ravioli, tomato Caprese, and more, in the comfort of your home! And just think, you will spend less money with your discounted gift card! Founded in Chicago in 1991, by June of 2015, they had grown to a chain of 49 locations throughout North America and the District of Columbia. 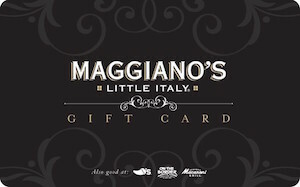 Your discounted Maggiano’s gift card will save you money on delicious Italian-American food at any of their locations! And what’s more, they have beautiful banquet space for special occasions, so remember to keep them in mind when you plan your next event! With Cards2Cash, great food and warm memories don’t have to break the bank! When you buy your Maggiano’s gift card from Cards2Cash, you will receive more value for your money! What’s more, you can use your gift card along with any other store offers and coupons that you may have- saving you even more money on the food you love! At Cards2Cash, we work to get you the best value for your dollar. Make sure you check out our listings for Carrabba’s, Olive Garden, Fazoli’s, and more! At Cards2Cash, we help you to get the most from your money! Do you have a Maggiano’s gift card that you aren’t going to use? Sell it to Cards2Cash, and we’ll turn that unwanted card into money! We pay the highest possible price for gift cards! If interested, visit one of our retail locations, and we’ll pay you on the spot, OR you may fill out our easy online form, and we’ll get back to you quickly with an offer for your card. Whether you want to buy a gift card or sell one, Cards2Cash has you covered!